It’s a new year, and that means a new Tips and Tricks Tuesday! Today’s guest post is by Laura Brooks from Sewing Makes Me Happy, and she’s here to tell us all about how to get our 2019 wardrobe ready for the new year. 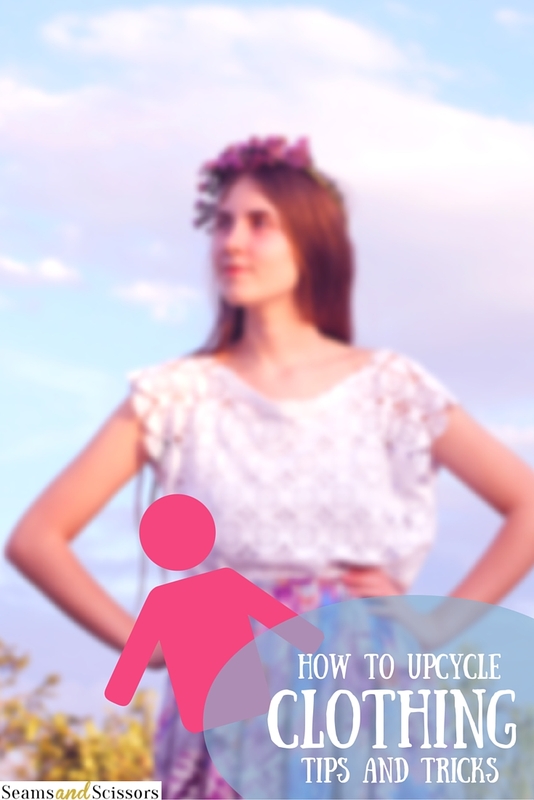 If you’ve wanted to learn how to upcycle some of your old garments but didn’t know where to start, this tutorial will tell you everything you need to know! We all have clothes that just sit in the back of the closet that never get worn. The pile seems to get bigger with each season! 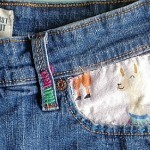 I even have jeans from college and they can easily be repurposed – Upcycled. With a little bit of sewing know how, a little bit of creativity, and these 5 simple steps you too can breathe new life into your wardrobe and create some really awesome items out of some not so awesome clothes. You’re going to need a large, open space to work. In this case, bigger is always better. The more space you have, the more you’ll be able to get done. You also want to be working on a solid surface to make cutting easier, and you’re probably going to want to make sure this is a surface that can get a little beat up. You’ll also need a sewing machine. 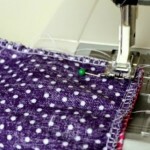 Many projects can be done by hand, but a sewing machine will make your project go faster and make your work much easier. 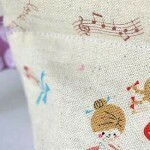 Sewing Makes Me Happy’s guide to beginner machines has some awesome sewing machines if you are just starting out. 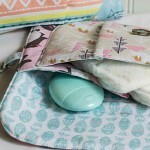 This is also a good tutorial for those of you new to sewing (and a good refresher for you seasoned pros!). 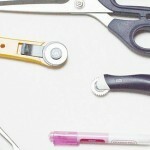 Many items make ideal upcycling materials. That shirt that doesn’t quite fit, that set of jeans with a hole in them, or even old socks and gloves. Clothes with holes in them can provide good fabric for projects, and as long as the rest of the garment is in good shape. 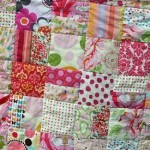 You can use this scrap fabric for a variety of sewing projects. Gather up all the items, and get them to your work space, and keep them organized! All of this preparation will make your life much easier once you start your project. So you’ve gathered your old clothes, your workspace is organized and ready to go. Now you need to figure out what you are going to make. There are several good websites out there for this. One of my favorites is this good housekeeping article on upcycling clothes, and I really like this trends and ideas article to help me brainstorm ideas. Keep searching, and use whatever resources you have to get some ideas. 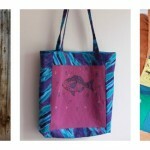 Your library or used book store also likely has some books on sewing and home-made upcycling projects. Got some ideas? Great! It’s time to pick a project. There are many simple lists for picking projects online, so search around. This is one of my favorites! This blog has some great tutorials to get you started as well. Once you have your idea or pattern, it’s time to sketch out what you are planning to do. Cut out any patterns, get your fabric cut and pinned, and start sewing! Once you get in the swing of upcycling your old clothes, you’ll find you start having more and more ideas for upcycling your old clothes. Keep a journal of what you did, and if you come up with new ideas, consider writing your own tutorial or keeping a blog about what you make. 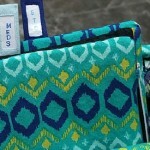 Your new clothes can make great gifts around the holidays as well! 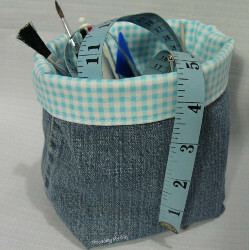 Laura Brooks blogs at www.sewingmakesmehappy.com and helps spread the word about sewing and upcycling. What projects have you upcycled lately?